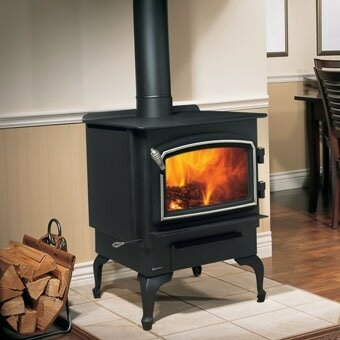 Regency F1100 - This Classic Small Wood Stove is perfect for smaller spaces, or for those needing to supplement a current heating system. Regency S2400 - This Classic Stove includes a Step Top design to give you a generous cook-top surface. Prepare meals even during power outages. Regency F3100 - This Stove is a great addition to a larger space and will comfort your family on the coldest of nights. Alterra CS1200 - This Contemporary Stove brings European trends to America. With an impressive 20% greater viewing area than traditional wood stoves. Regency F2400 - This Medium Stove provides the perfect amount of heat for most spaces. 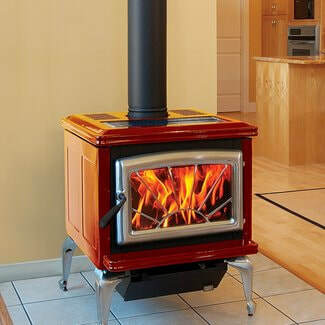 Load wood in this stove front to back or side to side. 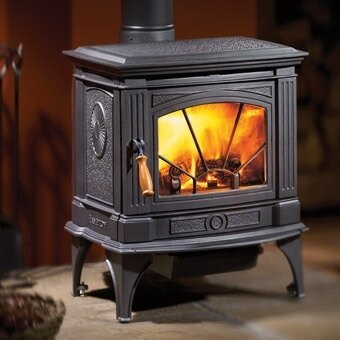 Regency F3500 Hybrid - This environmentally friendly stove has been designed with the latest wood burning technology. Hampton H200 - A beautiful combination of soft lines and delicate textures make this cast iron stove the perfect artistic backdrop for a roaring fire. Hampton H300 - This large Stove ensures warmth and comfort even when the power goes out. Clean up is a breeze with the sealed ash drawer. Regency F5100 Hybrid - This Extra-Large Wood Stove includes a door which opens a full 170 degrees, which lets you load up to 90 lbs. of 22" logs. Vista - An excellent choice for heating spaces from 500 to 1500 square feet. This high-performance stove is engineered for powerful heat output. Vista Classic - Combine the features and performance of the Vista with the timeless beauty of porcelain enamel for traditional elegance with outstanding heat and simple operation. Super - Easy to light, easy to load, and easy to maintain, the Super makes an excellent choice for heating spaces up to 2000 square feet. Super Classic - Enjoy all the outstanding features of the Super firebox beautifully clad in lustrous porcelain enamel. Your choice of elegant porcelain enamel, door, leg and trivet finishes. Summit - Crafted for maximum heating capacity, with the longest burn time, it is the stove of choice for bigger spaces and colder nights. Summit Classic - All the features of the Summit, in a beautiful, durable porcelain finish in your choice of colors - for an elegant, customizable package that can heat spaces up to 3000 square feet. Alderlea - With elegant, historic styling that adds to the decor of any room, it offers radiant and convective heat, with a concealed cook-top and a huge glass glass window. Available in 3 sizes with a choice of 4 colors. Neostone - The highly efficient Neo elegantly wrapped in natural soapstone. Each piece of soapstone retains heat while the stove is in use and slowly releases the heat back into the room. 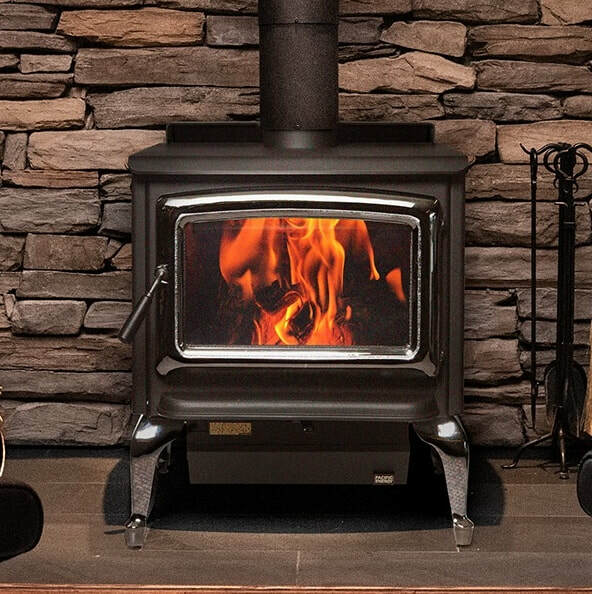 Napoleon Banff 1100C features advanced wood burning technology that provides you with the cleanest, most efficient heating experience. Napoleon Huntsville 1400 Pedestal - Cast iron doors and trivets are available in a variety of finishes to match any room in your home. Napoleon Huntsville 1400 Leg model - Heating area up to 2000 sq ft. Optional cast iron arched doors and trivets are available in a variety of finishes. Napoleon Banff 1400C features a design that boasts a European style, a decorative door with ceramic glass and a large view of the fire. 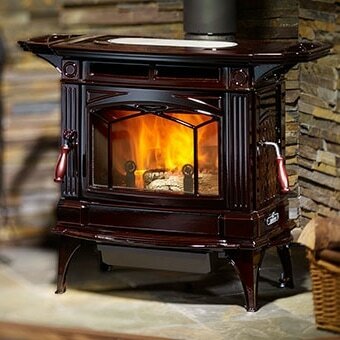 Napoleon Independence 1450 - Take your independence from the utility companies and save money heating your home with this economical wood stove! 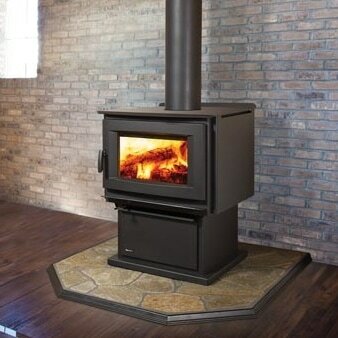 The Timberwolf Economizer Wood Stoves are available in three sizes. 2200 model - Heating area up up to 2000 sq ft. Available on Legs or pedestal. 2300 model - Heating area up to 3500 sq ft. . Available on pedestal only.